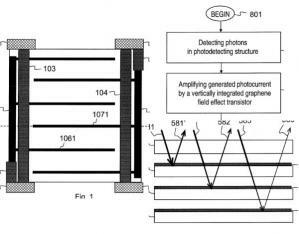 Nokia filed a new patent for a graphene-based photo detector. The new detector uses graphene as a photo-collecting layer, and also uses a graphene nanoribbon that acts as a field effect transistor to amplify the current and transfer it to the control electronics. Stacking several such detectors on top of each other with color filters can be done to detect colors. The big advantage of this graphene-based photo detector is graphene's transparency. The graphene sheet itself absorbs only 2.3% of the light (and does it very evenly across the whole light spectrum) and so should perform much better than CMOS in low light conditions. The graphene sensor will also be vastly thinner than current technologies, and potentially cheaper to produce (once graphene itself is available on the cheap).